Exceptionally hand-crafted eCommerce Joomla templates, designed to foster sales! Joobi templates integrates seamlessly with all Joobi eCommerce Apps, a perfect building block for your online store. Joobi Templates are built on top of Gantry 5 the most advanced responsive template framework in the world. Contact us any day of the week through our ticket system or forum and we’ll give you the best help as we can. Capture your customer's imaginations with these exceptionally high quality Joobi templates. 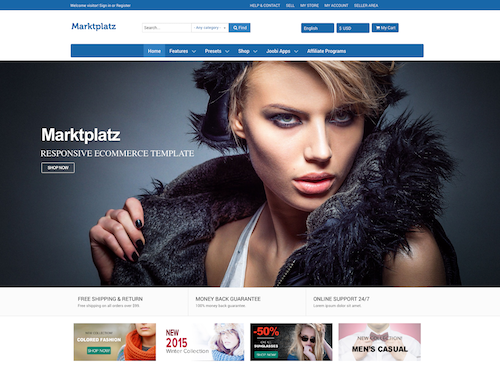 Marktplatz is responsive eCommerce template perfect for any type of online store. Ready to start and grow your business with us? If I'm not satisfied with my purchased Joobi Template, can I get a refund? No. Joobi is offering non-tangible irrevocable software products, we do not issue refunds after a Template is purchased. Please read our Refund Policy carefully before you purchase. What does my purchased template include? Joobi sell single template. During the membership you have access to support and regular updates of the template of your choice. If your membership expires, you can continue to use the template you have downloaded during your active membership. However you will not be able to access the download page, updates and support. Can you install the template Quick-starts for me? Yes, please purchase the quick-start service at $50 per installation. This will cover the installation of template quick-start package as seen in the Demo Site. No template customization is included. How many domains could I install the templates? You can install the template on as many domain as you want. However, support is only provided to 1 of your website. All template questions will be delivered exclusively through the Ticket System. We only cover support for the latest version of Joobi Templates. We do Not provide extensive help in terms of customizations. Please check Joobi Support Policy. I have an existing Premium Plan, am I eligible for a Free template? No. The template was never part of the subscription. The free template offer is complimentary to Joobi new Premium members (after December 9, 2015 purchases). Discount for existing active Premium plan users? For our existing premium members, since the template was never part of the subscription. We want to offer it to you as well on the condition you renew your plan. So we will give you a 50% discount now so you can get the template, and we will give your the other 50% once you renew your plan. Offer is only valid for users with active Premium plan. Please contact Joobi support via ticket system. What is the difference between Essential and Professional? Essential gives you access to support and updates for 3 months after purchase is made, while Professional entitles you for 1 year of support and update. Can I resell your templates? No. It is not allowed to resell Joobi Templates. However, you are entitled to customize everything visual to fit your brand. Can I download extensions built into Joobi templates? The quick-start package includes the demo version of Joobi Applications. In order to receive product updates and support you must purchase Joobi Apps membership. For 3rd party commercial extensions (Image Slider, etc..) must be purchase separately.